Published Jun 4, 2015 by Que. Part of the LiveLessons series. John LeMasney is a designer, artist, writer, poet, technologist, consultant, open web advocate, and open source evangelist who helps people use technology to improve their lives, work, and world. For over 20 years, he has consulted on technology, design, communication, and branding for academia, the enterprise, libraries, and consumers. He teaches at Rider University's Master of Arts in Organizational Leadership program, as well as at Princeton Public Library, Princeton Adult School, Library Link NJ, and other venues. He was previously Manager of Educational Technology Training and Outreach at Princeton University. 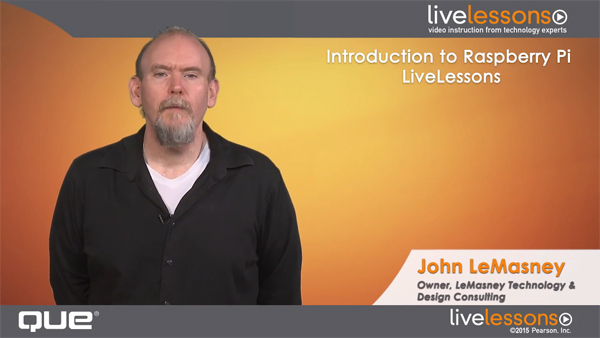 His many LiveLessons video tutorials include WordPress for Beginners LiveLessons and WordPress for Advanced Users. Tour the Raspberry Pi, check out each of its components, and discover how they fit together…review the specs of each Pi model…then, install your operating system and see the Raspberry Pi Desktop. Discover the power of Raspbian, the #1 operating system for Pi…learn how Raspbian differs from typical computer operating systems…use the command line…install new applications…browse the Internet…work with productivity tools…check out alternatives to Raspbian. Explore Scratch and Python, two great environments for learning to program your Pi…start building Scratch games, animations, and applications by snapping together simple “block” commands…discover the incredibly powerful Python environment for writing web, desktop, and other software…write your first Python script…plan to take your next steps with Python. Transform your Raspberry Pi into a dedicated workstation for creating graphic designs, photo manipulations, and document layouts…install and use Inkscape to create graphics…install GIMP and use it to edit photos…install Scribus, and use it for desktop publishing. Connect your Raspberry Pi to a breadboard and start experimenting with LEDs, buttons, and wires…walk through the essentials of connecting components to the Pi, “talking” with them, and controlling their behavior through program code. Install and use RaspBMC, the Raspberry Pi Media Center, an alternative Home Theater PC Operating System…attach your media source…browse and stream your media.